FILE - A man who identifies himself as Uighur poet and musician Abdurehim Heyit is seen in this still image taken from a video posted online by China Radio International's Turkish language service on Feb. 10, 2019. A new video showing detained Uighur poet and musician Abdurehim Heyit in apparent good health has silenced reports of the renowned artist's death, but done little to ease tensions between Turkey and China over the latter's treatment of its mainly Muslim Uighur minority. The video, in which Heyit confirms his health and Sunday's date, was released just one day after Turkey's foreign ministry announced its "deep sorrow" at Heyit's death and denounced his treatment by Chinese authorities. Analysts described the Turkish statement as a serious diplomatic blunder and suggested it could do lasting damage to Turkish-Chinese relations. 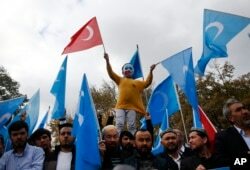 But others said the error does nothing to excuse China's reported detention of more than 1 million Uighurs in so-called "re-education camps" across northwest China's Xinjiang region — a move the Turkish Foreign Ministry spokesman has described as "a great cause of shame for humanity." FILE - Uighurs and their supporters rally across the street from United Nations headquarters in New York, March 15, 2018. Members of the Uighur Muslim ethnic group are calling on China to post videos of their relatives who have disappeared into a vast system of internment camps. The campaign follows the release of a state media video showing famed Uighur musician Abdurehim Heyit, who many believed had died in custody. "The Turkish government may be wrong about one single case [of Heyit]. But overall, I think the world's level of attention in Xinjiang continues to put pressure on Beijing," said Arthur Ding, an adjunct research fellow at National Chengchi University's Institute of International Relations. Heyit, a 57-year-old singer and musician for a troupe in Xinjiang, was arrested in early 2017 on suspicion of endangering national security. The fact that Heyit remains under investigation after two years of detention "is further evidence of the extra-judicial nature of such detentions," Michael Clarke, an associate professor at Australian National University's National Security College, said in an email to VOA. The Sydney-based professor added that China needs to prove the authenticity of Heyit's video, which he saw as evidence that China is starting to feel the pressure of international criticism on its Xinjiang policies. Both Clarke and Ding said the apparently erroneous reports of Heyit's death were an understandable result of China's lack of transparency about its actions in Xinjiang, and of the concern those actions have caused around the world. Yet China has given no indication that it intends to be more open about its treatment of Heyit or its plans for the Uighur internment camps. During a press briefing Monday, Chinese Foreign Ministry spokeswoman Hua Chunying brushed aside a reporter's request for more details about Heyit, repeatedly pointing a finger at Turkey. "Turkey made groundless accusations against China based on the absurd lie of portraying the living as dead. This is extremely wrong and irresponsible, and we firmly oppose it," she said. FILE - A child from the Uighur community living in Turkey, who is wearing a mask in the colors of the flag which ethnic Uighurs call East Turkestan and with a painted hand with the colors of China's flag, participates in a protest in Istanbul, Nov. 6, 2018, against alleged oppression by the Chinese government to Muslim Uighurs in the far-western Xinjiang province. Beijing on Tuesday issued a travel alert warning its citizens against visiting Turkey; similar warnings have been issued since December regarding travel to Canada and Sweden. Turkish Foreign Ministry spokesman Hami Aksoy has not commented since his statement Saturday claimed that Turkey had learned of Heyit's death and accusing China of serious human rights violations, including the establishment of concentration camps for the Turkic-speaking Uighurs in Xinjiang. Tugrul Keskin, director of the Center for the Global Governance at Shanghai University, argued that Aksoy made a serious diplomatic mistake by issuing his statement without first confirming the death with his Chinese counterpart. "While Turkey is not happy about U.S. foreign policy on Kurdish issues and is searching for new global partners, they should not issue such a statement, based on the fake news," Keskin said in an email exchange with VOA. The blunder will hurt Turkey's relations with China now and in future, he said, adding that the Uighur issue is as complicated as the Kurdish issue in the Middle East, involving China, Turkey, the United States and the diaspora Uighur community. Keskin said he doubts that other mainly Muslim countries will speak out about the fate of the Uighurs as Turkey has done. Clarke, the Australian National University professor, agreed, noting that many of the region's Muslim nations, especially in Central Asia and the Middle East, "have viewed China as a counter-weight to the US and a source of investment under the BRI [Belt and Road Initiative]." But, he emailed, "there are some signs that Central Asian states (e.g. Kazakhstan) or more accurately their public are becoming more critical on this issue as ethnic Kazakhs and Kyrgyz in Xinjiang have also been caught up in the camps." Keskin disapproved of the international intervention on Xinjiang, charging that neither the U.S. nor Turkey really cares about the conditions of the Uighurs in Xinjiang. He suggested the two nations simply want to use the issue to pressure China in political negotiations. But many rights activists feel strongly about the issue. Sixteen human rights groups have called for an international investigation into China's mass incarceration of the Uighurs and other Turkic Muslims in Xinjiang. They have also urged the U.N. Human Rights Council to adopt a resolution establishing an international fact-finding mission to Xinjiang.